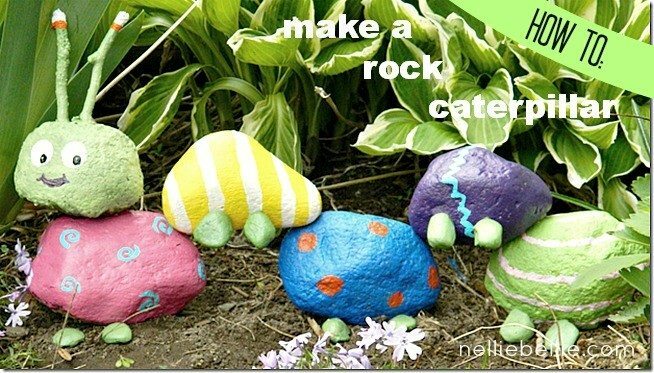 These fun garden rock caterpillars was originally posted in July of 2012 but we have updated the information, images, and content to give you better in-process photos and directions. 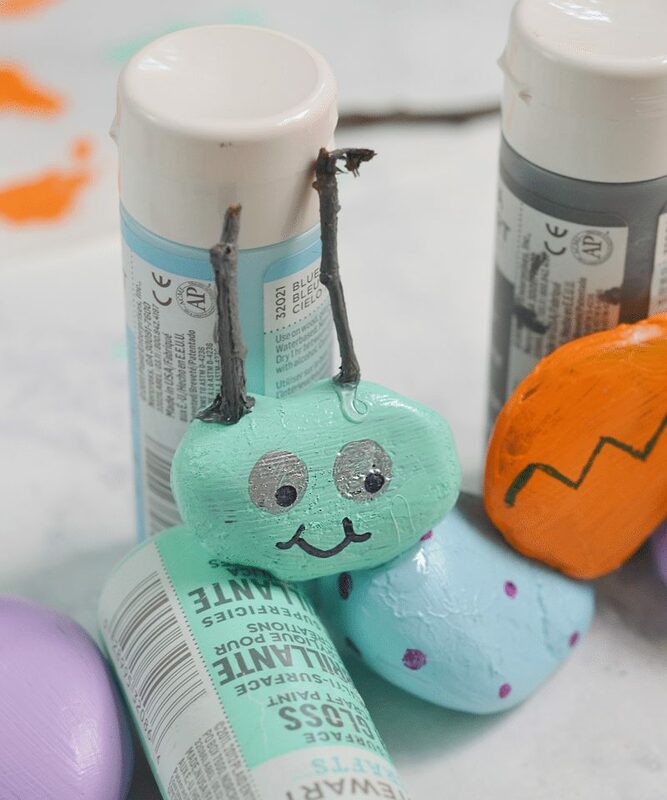 We have been surprised by the popularity of this garden caterpillar but are so pleased so many of you are making this rock craft with your children and grandchildren. 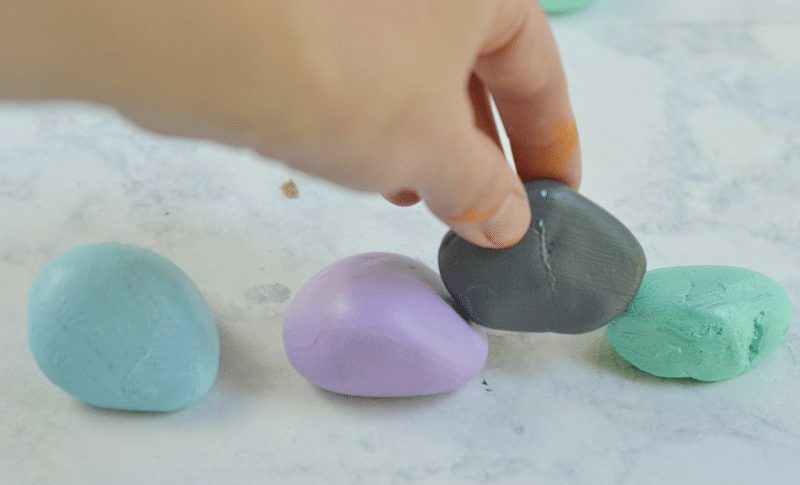 It is so delightful to know that you are heading out to find rocks, twigs, and paint to create an old-fashioned type project that reminds us of days gone by. 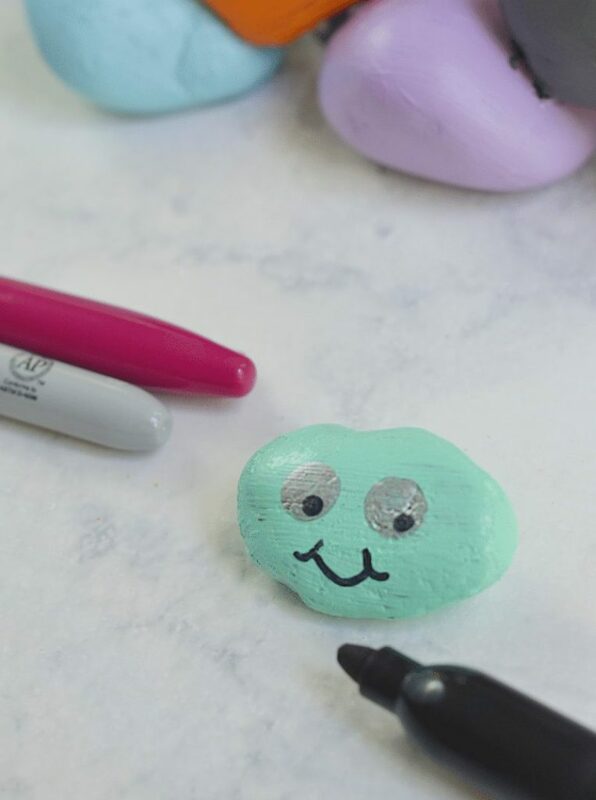 We hope that this project remains popular and the new updates will help bring it to those of you looking for easy rock painting ideas. Happy crafting! Activities that involve using nature’s finds for creating are brilliant for keeping kids busy, and is also great for their creativity. Not only do spend time crafting but they also spend time outdoors finding items. Bonus! You get them outdoors for a bit which, in some electronic filled homes, is hard to do AND you get them crafting. This project is great for remembering your childhood and giving your children a piece of it, too. It’s recommended that you paint them multiple colors, for fun. But you can certainly paint them all one color if you like. Have fun! Be prepared to take some time on this part. You need to paint one side, let it dry, and then paint the other. Sometimes for multiple coats. It is not difficult, at all, and a great time to watch a favorite movie and have some snacks. Be prepared, this is going to get messy. Messy is fun. Pull out your hair dryer to make the drying time go faster. 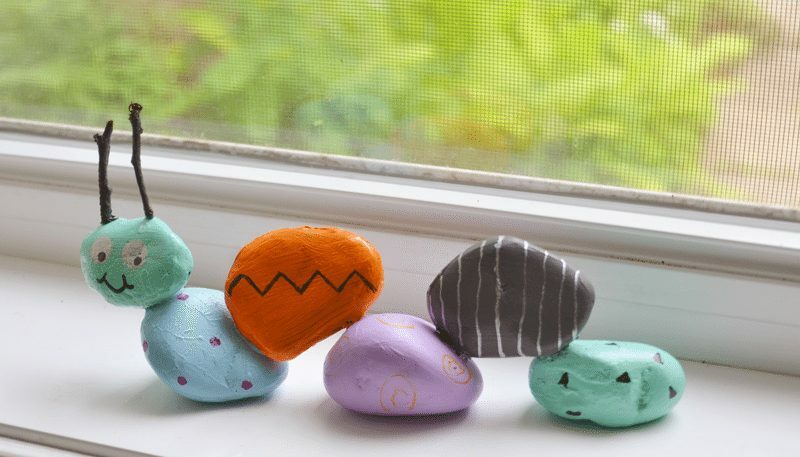 If making the garden rock caterpillar with children, they love to use the dryer on their own! 2. Draw the face on your caterpillar’s “head”. One of the easiest ways to do this is with q-tips and the paint you are currently using. Or, you could pull out some permanent markers (Not recommended with children). Be sure to wait until the paint on the rock has properly dried before adding your face. 3. Assemble the caterpillar after the paint has properly dried! Put the head in place and then balance the remaining rocks onto one another. Often you will want to prop up the rocks with a paint container, another rock, or whatever works. This is another great time to pull out the hairdryer. Prop up as much of the caterpillar as you can and then give it a shot with the dryer. It will help it be more secure and dry faster. 4. 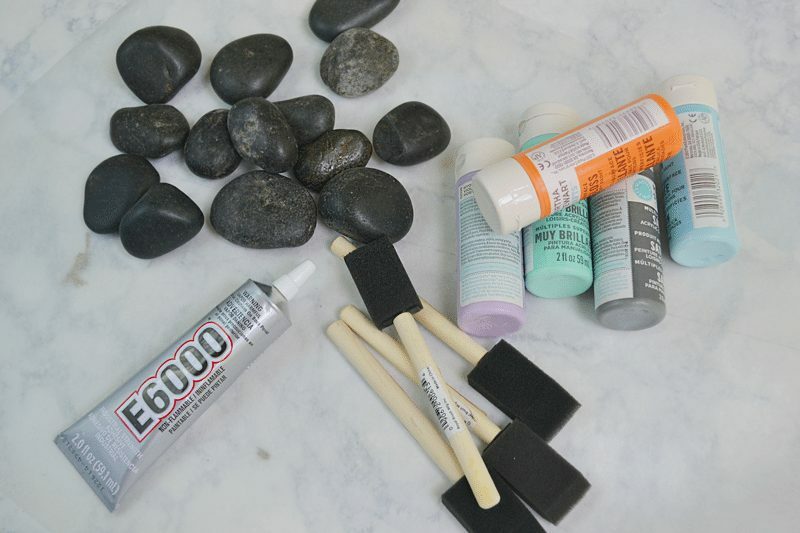 Attach the “antennae” (sticks) with your waterproof glue. You need to attach your “antennae” to the first rock on the body. Use rocks, bottles, books, whatever you can find to prop them up while they dry. Let dry for several hours. 5. Let your whole caterpillar dry and cure overnight. Note, if this is a project you are making and sending home with children consider putting it together on a sturdy piece of cardboard or wood so that it can be easily transported. You still want to have several hours before you try to transport it but it will be more secure if moved as one piece. 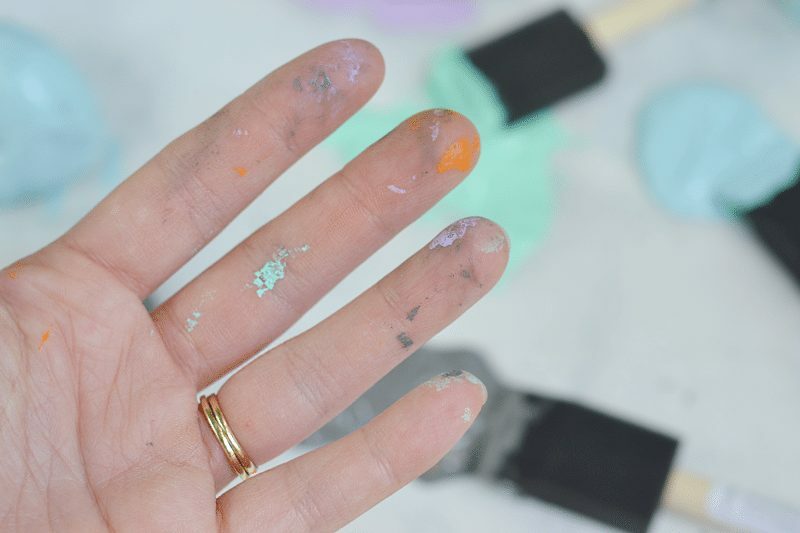 Good craft paint (we love Martha Stewart’s line) will dry faster, have truer colors, be easier to wash off, and make the whole experience a better one for kids. Also, many of the good paints have coordinating colors. Yay! Not thinking and matching. Don’t fret about how many coats the caterpillar has. Or feet, for that matter. One coat of paint on one side may be all some kids will want to attempt. That’s okay, the idea is still there. 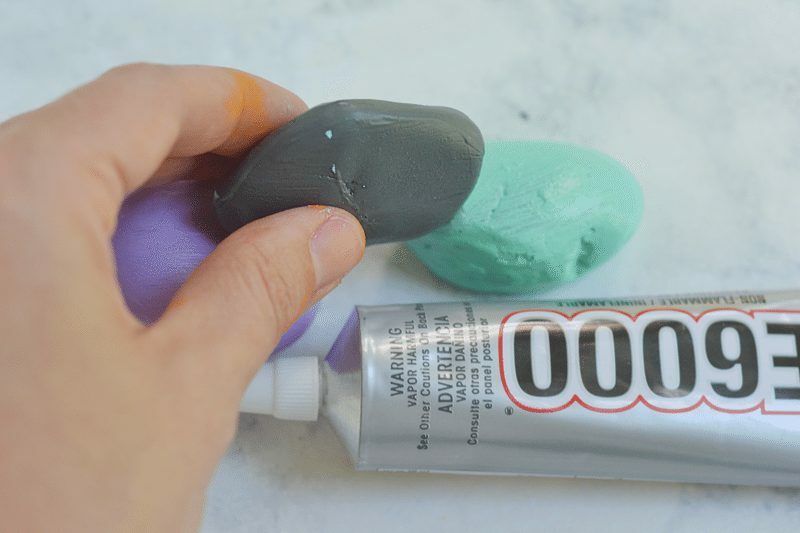 If you are really wanting proper painting on all sides and all coats think about a fun activity, snack, or game that can happen while the coats are drying. And the caterpillar looks just as cute without the extra little rock “feet”. Did you notice our updated caterpillar doesn’t have them? Still cute, right! No amount of “don’t get this on your clothes” is going to keep paint off of kids clothes. Wrap kids in old shirts, dish towels, aprons, or whatever you can find. Have paper towels or wipes on hand. And, if possible, go outside! And always… always… line a table with MORE than you think. We recommend cheap plastic tablecloths because they are inexpensive, disposable, and waterproof. Sponge brushes are so inexpensive that they can simply be tossed. It makes it so much more manageable for a different color paint to have it’s own brush… or two. Remember it’s about the experience! Kids will not grow up to love art and creating with their hands if you are a perfectionist, clean freak, or micro-manager. Choose a proper project for the child, be well-prepared, give direction, and then sit back and let them be. The joy they have in creating something is the best part. Having a good experience means they will be willing to repeat it. Maybe for a bit longer and a bit more complicated next time.